Bikeability Scotland provides training for children to give them the skills and confidence needed to ride safely on the roads. This training couldn’t take place without the hard work and support of our instructors. The instructors play a huge role at introducing children to the wonderful activity that cycling is. You will introduce and encourage kids to this healthy, environmentally-friendly and fun mode of transport. The training is usually delivered in a school setting. 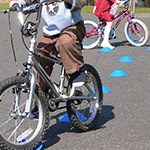 As a Bikeability Scotland guide, level 1 is delivered in P5, level 2 in P6 and level 3 in P7-S2. • If you’re a member of school (perhaps a teaching assistant, class teacher, cook or janitor!) or work for a local authority, please contact your local authority co-ordinator and ask to attend a course. • If you’re a volunteer (a parent or member of the local community), please contact your local authority coordinator to find out the procedure in your area. There are two qualifications that you can choose from - the Cycle Training Assistant (CTA) which is a one-day course for delivering level 1 and 2 training and the four-day Cycle Trainer course for delivering all three levels. The course options can be found here. The CTA course will teach you how to plan, prepare, deliver and conclude training sessions, including dynamic risk assessments of playground and on-road training locations. Cycle Training Assistants might receive support during the first few sessions and should then be able to deliver training independently. The Cycle Trainer course will allow you to deliver all 3 levels of Bikeability Scotland as well as any course that teaches the National Standard for cycle training. You will also be able to act as Cycle Ride Leaders and can conduct static risk assessments on cycling routes and training venues. Anyone delivering Bikeability Scotland in schools, either on a voluntary basis or as part of their school/local authority job, will be able to train as an instructor free of charge. For more information please visit the Bikeability website or contact bikeability@cycling.scot with any questions.